Codota is a website proposing Android code snippets on various subjects. Although they don't have much content yet, the idea seems great. Anyway I'm more interested in their new Chrome Extension : Livecode. 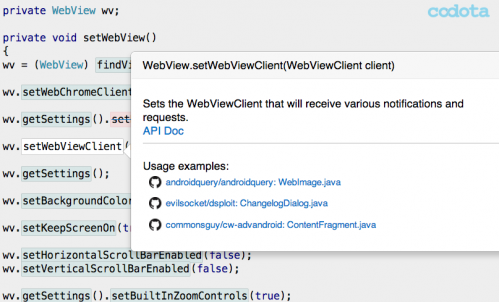 This extension will make all Android classes and methods clickable on Codota an Stackoverflow. Clicking will then display the official documentation of the class / method directly. This is just a great tool when you spend your time on StackOverflow ! When deploying an app on a Store, be it Google's Play Store or Amazon's, or any other, a developer needs to create goodlooking screenshots. And often, the screenshot is not as clean as it can, mainly because of the status bar, showing a low battery, or numerous icons (unread mails, social network notifications, ...). 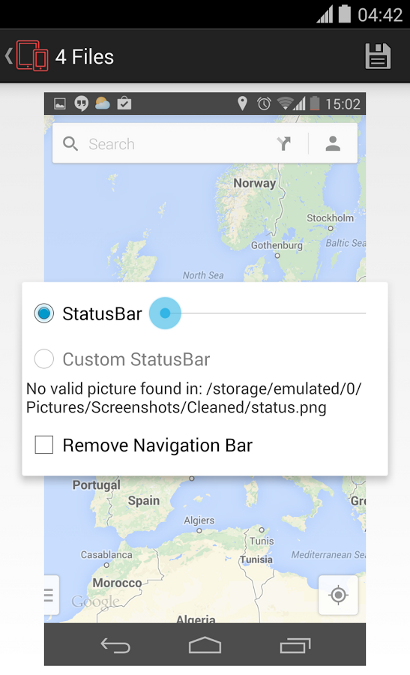 Screenshot Cleaner takes your screenshot and cleans the status bar, making your screenshots look professional. Sometimes, you want an Activity or a Broadcast Receiver to listen for a specific intent, which is not always easy to test. There are some applications, like With Intent which let you declare and send an intent. But you then need to be outside of your app. I just discovered that you can use ADB to send an intent to any device (physical or emulated). Here are a couple of sample command you can run in your shell (assuming your sdk/platfor-tools is in your path) to start activities. adb shell am start -a "android.intent.action.VIEW" -d "http://developer.android.com"
adb shell am start -a "android.intent.action.SEND" --es "android.intent.extra.TEXT" "Hello World" -t "text/plain"
adb shell am start -n "com.example.application/.MainActivity"
adb shell am startservice -n "com.example.application/.BackgroundService"
adb shell am broadcast -a "android.intent.action.PACKAGE_FIRST_LAUNCH" -d "com.example.application"
You'll find all the options you can use in the Official Documentation. The Android NDK can get really powerful, but one of the few drawbacks is that the Android.mk configuration file must list the source files. And if your project contains too many files, it can get quite difficult to maintain. Here's a little tip to list the files in a JNI source trees that is more readable, and more maintainable. 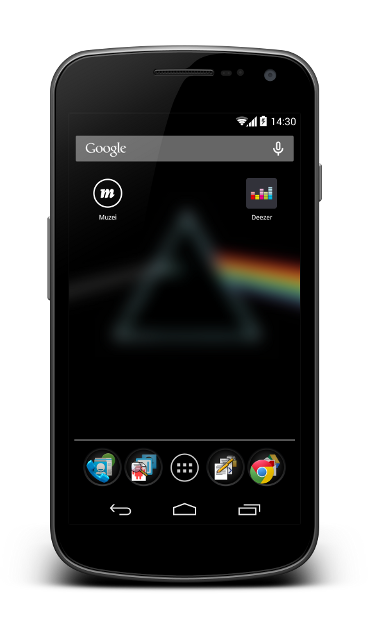 So, a couple of weeks earlier, Roman Nurik released an Android Live Wallpaper allowing other developers to create plugins. If you don't know it already, check it out, as well as the extensions. As soon as it got out, I knew I wanted to play with this new toy, and it was not hard to get an idea of extension to do. As I work at Deezer, I thought "Hey, let's use album covers as wallpapers!". A little bit of code later, and here is my contribution to Muzei : MuzeiDeezerAlbums. from your favorite albums (requires you to log in). Here I used the logcat command but it's the same thing when you want to install an apk or pull a file from a device. I've just discovered that if you don't specify a serial, adb will look for an environment variable named ANDROID_SERIAL to know which device to use. If you're often using several devices in USB, you can just add the following aliases to your .bashrc file. When using the adb logcat command, you can also set in the ANDROID_LOG_TAGS environment variable a list of tag/severity filter, like in the following example. These tips are fully compatible with the PidCat tool I talked about earlier. Many apps exists to enforce good UI design in Android Apps, some embedded in the developper settings screen. This app is a small simple app that you can add to your toolbox. 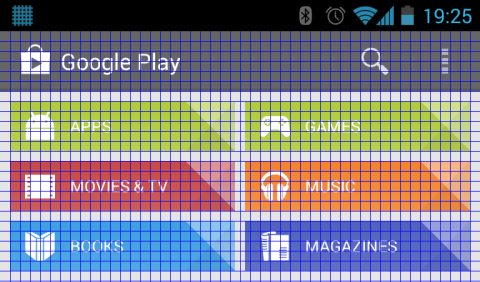 As you can see on the screenshot above, the app draws a grid above your Android UI, to let you see if your views are aligned following the design guidelines.